Background & Methodology: Swertia punicea (Shuihuanglian), a Tujia Ethnomedicine component is a complementary part of the Traditional Chinese Medicine (TCM). It has been employed by the TCM practitioners as part of the formulations for treatment of a variety of health disorders. Keeping in view the high medicinal value of the plant, the natural product chemists have ventured to study its chemical nature and isolate some of the fascinating molecules, which account for its pharmacological activities. Results: So far about 78 compounds have been reported from the plant. 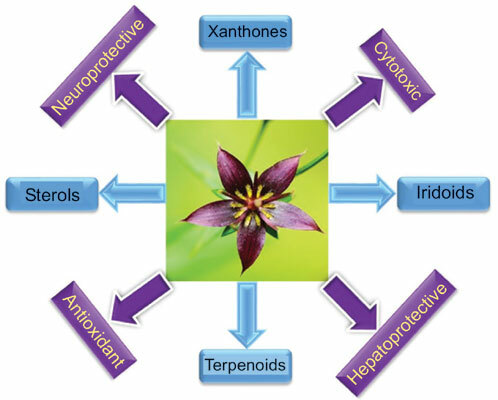 Xanthones and iridoids are the major constituents of S. punicea along with some sterols, terpenes and other molecules. Some of these compounds have exhibited significant biological potential. Conclusion: This article emphasizes on the importance of S. punicea in TCM and the bioactivities of the compounds isolated till date. Swertia punicea, Traditional Chinese Medicine, Tujia Ethnomedicine, Xanthones, Iridoids, Chemical constituents.